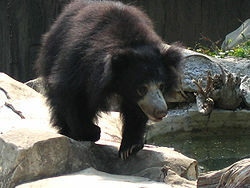 The Sloth Bear (Melursus ursinus) is a bear that lives in India and Sri Lanka. Sloth Bears have long and shaggy black fur, but its fur can also be brown. On its chest it has a white or yellow mark, which is shaped like an Y or V. They have big feet with long claws. The long claws are also the reason for its English name, because the claws look like the claws of a Sloth. Sloth Bears eat insects, like for example termites. But they also eat fruit, honey, eggs, and also meat. Female Sloth Bears usually have 1-2 babies, sometimes 3. Young Sloth Bears stay with their mother for 2-3 years. In captivity they can live to be 40 years old. Sloth bear adults can weigh anywhere from 120-130 pounds and measure anywhere from 60-70 inches in length. Wikispecies has information on: Sloth Bear. Wikimedia Commons has media related to Melursus ursinus. This page was last changed on 12 December 2018, at 21:48.